Ways to help at home. There are many ways you can help. The most valuable asset is your promise of a little of your time. When we are ready to plant all the young trees the children have grown, we will need work parties. A chance to get together and have fun, whilst creating the wood, its paths and its wildlife friendly hedges. You could also donate money, trees, tools or equipment, all will be appreciated and all supporters, TWIGs, will get their names up on the sign board in the wood. All the children that have helped collect seeds, planted them and grown the trees, the hedging etc, and those who assist in the plantings, will automatically become TWIGLETS, with their names added too. This list will be updated all the time. John Williams, Bluebell Cottage, Grange Road, Tillingham or email us at the address below. 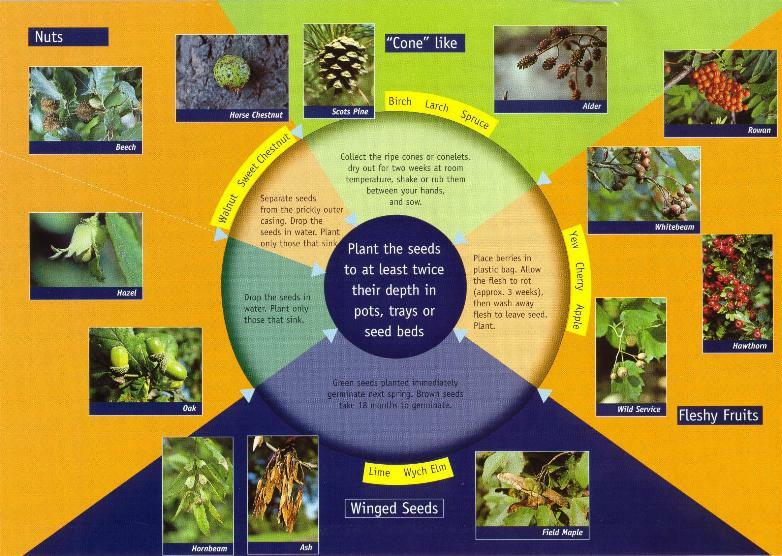 This is the Tree Council's Seed chart that may be of use if gathering and planting at home.